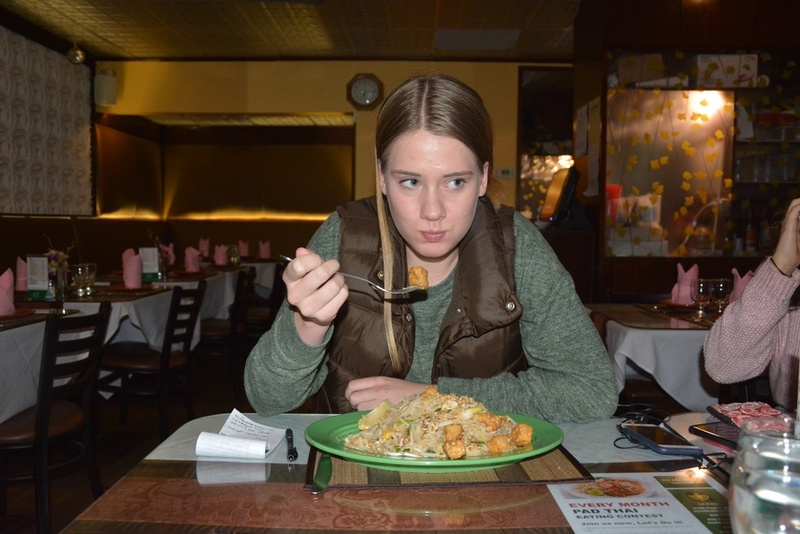 Suuba M. Demby Contributing writer Trina M. Lilja ‘22 regrets her decision to take on the pad Thai challenge. I will never eat pad thai again. I will never eat pad thai again. I will never eat pad thai again. I chant this to myself as I flee Spicies, the accursed Thai restaurant previously known as Spice Thai. It’s only my first visit but I already know that I will never cleanse myself of the horrors I witnessed there. I feel ready. I’ve been fasting since, well, lunch, and my stomach is as prepared as it will ever be to endure a pad thai eating contest. If I can eat an entire plate of Spice pad thai the restaurant will award me $100 in cash and a $100 gift certificate. But, as I arrive at the restaurant, I read the flyer posted in their window: “Eat as fast as you can! !” Ice-cold fear clenches my heart: I had forgotten the speed requirement. I’m ready to eat a plate of pad thai — but not in five minutes. As I drag myself across the threshold of Spicies, I first notice the unsettling darkness of the restaurant. It is barely 6 p.m. and the night sky is already black. Spicies has dimmed the lights to a foreboding gloom. I feel a rising wave of panic. I am intimidated by the incoherent collage of decorations for Valentine’s Day, Christmas, and Saint Patrick’s Day plastered across the walls. The desperate cheer feels like it is trying to tell me something that I am failing to understand. The mirrors on the wall seem to be there for the sole purpose of allowing me to witness my own shame. I tell the waitress who seats us that I am here to try the pad thai challenge. She pauses: “Are you sure? It’s... big.” She holds her arms apart as if to warn me that I’ll have to force down about a fully grown sloth’s worth of noodles. Do I detect a note of pity in her voice? My friend — who is accompanying me for moral support — swears tofu will go down easier: it doesn’t need to be chewed. Because I am afraid, I set my intense dislike of tofu aside and order the dish with tofu. Is this a mistake? The glistening pad Thai mountain arrives — it’s not quite fully grown-sloth-size, but, perhaps, adolescent-sloth-size. Still, it is more noodles than I have seen in my life. It dwarfs the jaunty lemon wedge resting on the side of the plate. I feel small. The group of four sitting beside us rises and leaves, so the mirrors on the wall are denuded of reflected inhabitants. Now everyone in the restaurant will be able to watch my self-destruction from every angle. I glance at the group of servers at the front desk. They clearly pity me. The first few bites are not terrible. I like pad thai, after all. But I push past this enjoyment purposefully — who has time to savor in a competition like this? After six bites, it’s no longer pad thai, just a clump of carbs that I have to defeat. I press more and more down my throat, barely chewing, barely swallowing. My friend ties my hair back: I am reverse-vomiting noodles. Glasses of water keep appearing on the table beside me: the waitstaff all want a close-up glimpse of the spectacle. I have three glasses surrounding me, and I gulped each one helplessly: maybe they would rinse the wet soy mush from my mouth. I look at nothing and I observe no details: I am on a mission. The ticking of the clock seems deafening until I realize there is no clock. It feels like months since I began, years since I swallowed my first noodle. I glance up to see the group in the corner — the only other people in this dark, deserted hellscape. They look at me with open revulsion. The lemon on the side of the plate taunts me. In a fit of rage, I bit into its flesh. The sudden burst of clean bright citrus feels almost transcendent. I hit my second wind; I realize that the lemon was my ally all along. I’m more than halfway done. I remember exactly how much I hate tofu as it re-emerges in a surge of bile in the back of my throat. I swallow it down. Barely a quarter of the plate left, and never before in my 18 years, one month, and 30 days upon this earth have I felt such an utter disgust for food. It seems fully possible for one bleak moment that I will not make it to see 18 years and two months. Each noodle looks like the serpent in the Garden of Eden. Tofu is Satan and original sin combined; tofu will torment me and my children for generations to come. Even that messianic lemon wedge, which died for my sins, cannot save me now. I don’t look to the right; I know that in the mirror I would see a creature, far from the fresh-faced young girl who walked so innocently into Spicies all those years ago. My mind is consumed by the passage of time. And then, all of a sudden, it is over. My five minutes are up. 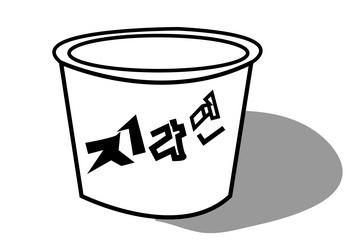 I know I have failed; I know it is the tofu that ruined me. “You have a nice restaurant. I don’t want to throw up in it,” I tell the waitstaff. They seem to avoid my eyes now that I’ve failed. They dared to believe in me and I disappointed them. I pay my bill and hobble back towards my dorm. My friend and I bid each other a good night, one of us 70 percent water and the other 70 percent pad thai. Later that night, after re-emerging from my dorm, I pass the site of my trauma. I catch a glimpse of the assorted shiny plastic holiday decorations and feel my body convulse. I can still taste the shame of my defeat. Do the Spicies pad Thai challenge if you dare, but take this as a warning: there are some things you cannot unlive.